In Nookal, all group sessions are referred to as Classes. It is possible to set as many different Classes as required so that duration, pricing, item codes, etc. are accurate for booking, invoicing and reporting purposes. Below explains what goes in each field when creating Classes and how each field is used in Nookal. 2. Click Classes under Setup. 4. Add a Service Code. Service codes will be displayed on invoices and should exactly match any code required by third-party payers to pay for Classes. 6. Add a Description. The Description will be displayed on the invoice. It should match any third-party payer’s requirements. 7. Select a Category the Class belongs to or create a new Category for this Class. Categories are used for sorting and reporting purposes. 8. Set a Colour for the Class. The Colour will be displayed in the Diary when this Class is booked. 9. Set the Duration in minutes. The Duration will automatically be blocked off in the Diary for this Class when it is booked. 10. 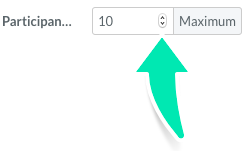 Set a maximum number of Participants for the Class if required. 11. Add a Price for the Class. Good to know: If the price includes Sales Tax, tick the incl. Tax box, so that the Tax report will be generated accurately. 12. Once the above has been set up, click Create Class or keep going with additional options below. 1. If there are many Classes and practitioners to manage in the account, it is possible to specify which practitioner(s) provides the Class so that it comes up at the top when booking a Client with these practitioners. Click in the Providers field to select the appropriate Provider(s). 2. If there are many Locations and some Classes are only used in specific Locations, click Selection next to Locations and tick the appropriate ones. 3. If Insurance pays for this Class, tick Enable Third-Party Clients so they can be booked in this Class. If necessary, add specific pricing for Third Party clients. 4. 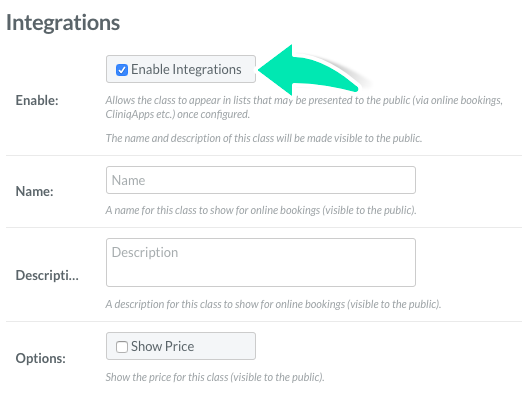 If using Online Bookings or other Integrations for this Classes, tick Enable Integrations. Once ticked, configure other details where appropriate. 5. Once the desired updates have been completed, click Create Class.